Botanical Name: Borago Officinalis. Extraction Method: Cold Pressed. Obtained From: Seeds. Organic: Made without pesticides, GMO's, or hexane. 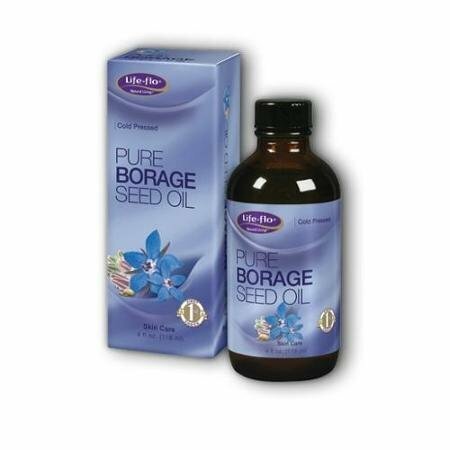 Ingredients: Borage seed oil, 100% Pure with NO additives or carriers added. Description: Borage Carrier Oil is well known as one of the richest sources of essential fatty acids known to man. 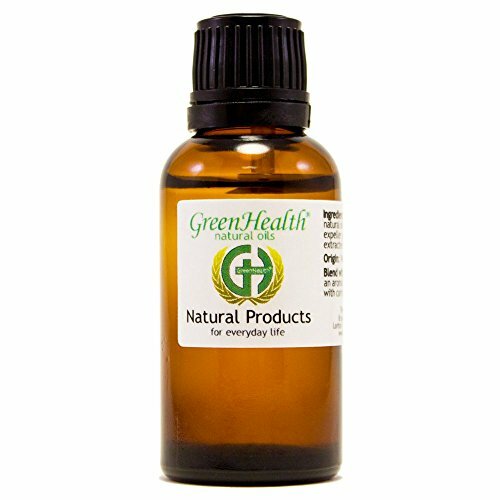 It is the richest source of gamma linolenic acid (GLA) - up to 25%. This helps to encourage mobile joints and tissues. It is also a fantastic source for vitamins, and minerals. Users can apply it to both sunburned and aged skin, though because of the price and oily residue, many will use in dilution with other carrier oils. Color: Pale yellow to golden yellow liquid. Common Uses: Small amounts (10% or less) of Borage is often added to other carrier oils for fortification. It is applicable for all skin types and is commonly used in manufacturing, aromatherapy applications and by massage therapists. Prized oil for its abundant dietary, health, cosmetic and medicinal benefits. 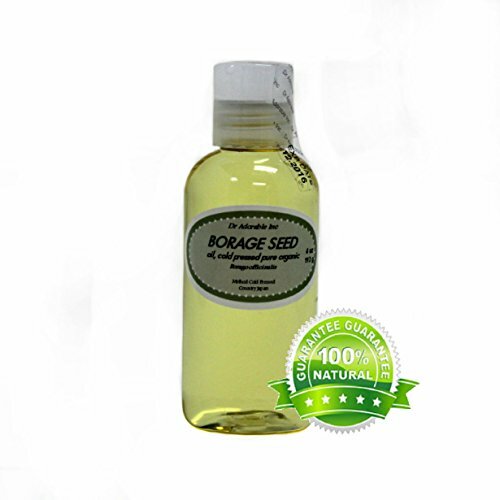 Borage seed oil is a wonderful oil for use in massage, skin and hair care, it is the richest source of Omega 6 fatty acid of any seed based oil. Borage Seed oil is ideally suited for use on prematurely aged skin and for regenerating skin cell activity. Consistency: Typical and Characteristic of Carrier Oils. Absorption: Leaves an oily feeling on the skin. We are buying our oils from organic certified supplier, made from organic ingredients. Shelf Life: Users can expect a shelf life of 1 year with proper storage conditions (cool, out of direct sunlight). Your item(s) will be shipped the same business day or next business day of confirmation of payment if received by 3:00 pm PST. (not including weekends or holidays). When you receive your item and are pleased with our transaction, please let us know by leaving positive feedback, we will do the same for you in return. Look forward to do business with you, H&B OILS CENTER Co.
Borage Seed Oil - Borage Oil - Organic - Cold Pressed - 100% Pure Natural Skin Body Anti-Inflammatory Extra Virgin Unrefined Premium Pharmaceutical Grade 4 oz Borage is an annual that is a native of Europe but has been widely naturalized in other areas. The stem and leaves are covered with coarse, prickly hairs. The bright blue flowers are star-shaped. The fresh plant has a salty flavor and a cucumber-like odor. Modern use of borage primarily comes from the use of the seeds to make borage seed oil, which contains a high content of the essential fatty acid known as gamma-linolenic acid (GLA). GLA is part of the inflammatory mediation process. Thus GLA supplements might be expected to have an impact on a variety of diseases and inflammatory conditions such as rheumatoid arthritis, and atopic eczema. Limited information involving the use of borage seed oil is available on treating any of these conditions. Other uses Borage may also be useful in the treatment of osteoporosis. Borage oil is one of the herbal oils that I recommend for alleviating pain and other symptoms of inflammation. This oil has many other uses, such as: Moisturizing your skin. 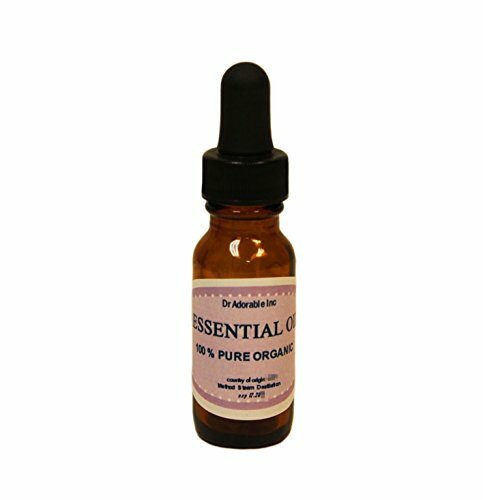 It's an effective natural anti-aging oil that repairs and hydrates your skin. Relieving discomfort among women, such as breast tenderness, premenstrual stress, endometriosis, PMS symptoms, and menopausal symptoms. Borage oil also helps ease related cramping and pain. Reducing stress and high blood pressure. Borage oil is used in aromatherapy.It blends well with other thin and easily absorbed oils like jojoba, rosehip, thistle, and sweet almond oils. Borage oil is said to have an uplifting and euphoric effect, and may help ease mood swings and depression. Extraction Method: Cold Pressed. Description: Borage Carrier Oil is well known as one of the richest sources of essential fatty acids known to man. It is the richest source of gamma linolenic acid (GLA) - up to 25%. This helps to encourage mobile joints and tissues. It is also a fantastic source for vitamins, and minerals. 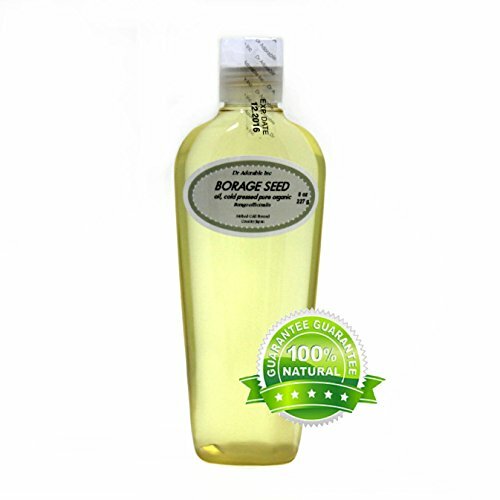 Aromatic Description: Borage (Refined) Carrier Oil has been bleached and deodorized and has been through filters to eliminate impurities and does not have any odor to it. Common Uses: Small amounts (10% or less) of Borage is often added to other carrier oils for fortification. It is applicable for all skin types and is commonly used in manufacturing, aromatherapy applications and by massage therapists. A prized oil for its abundant dietary, health, cosmetic and medicinal benefits. Borage seed oil is a wonderful oil for use in massage, skin and hair care, it is the richest source of Omega 6 fatty acid of any seed based oil. Borage Seed oil is ideally suited for use on prematurely aged skin and for regenerating skin cell activity. We are buying our oils from organic certified supplier, made from organic ingredients. Shelf Life: Users can expect a shelf life of 1 year with proper storage conditions (cool, out of direct sunlight). Your item(s) will be shipped the same business day or next business day of confirmation of payment if received by 3:00 pm PST. (not including weekends or holidays). When you receive your item and are pleased with our transaction, please let us know by leaving positive feedback, we will do the same for you in return. Look forward to do business with you, H&B OILS CENTER Co.
Botanical Name: Borago officinalis Extraction Method: CO2 extraction Scent: Light and sweet Origin: Japan Because of its extremely high levels of gamma linolenic acid, Borage Seed Oil has many potential uses. It has been widely studied for its ability to calm and reduce inflammation, and has been used successfully to alleviate the pain, swelling, and joint stiffness associated with rheumatoid arthritis. Borage Seed Oil has also been used with positive results for many different skin disorders, such as psoriasis, eczema, acne, rosacea, and prematurely matured skin. 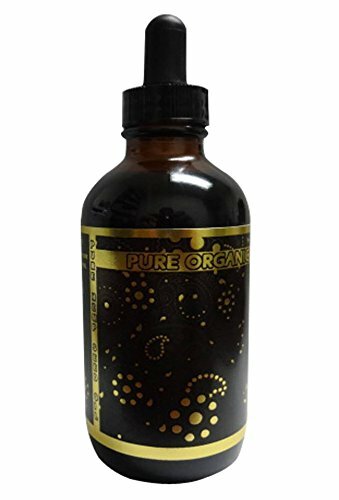 HIGH ALTITUDE ORGANICS TM Borage Seed Oil, Cold-pressed from organic seeds of the Borage plant without any chemical solvents. It is a natural oil that not only restores moisture and smoothness to dry and damaged skin. Borage, also known as Starflower, is rich in the Omega 6 essential fatty acid GLA (gamma-linolenic acid - 18 GLA). The GLA content in Borage Oil typically falls in the range of 16%-27% which is the highest level of GLA found in any readily available specialty oil. After extracting the oil from the seed of the plant, the Borage Oil is refined resulting in a clear honey colored oil with a bland odor and taste. It helps with skin clearing and lightening, promoting healthy skin growth and acts as an anti-inflammatory. Borage oil is of great use on problem skins, especially with acne, pimples and blemishes. Borage oil may benefit people suffered from eczema or other skin inflammation. Studies have shown the effectiveness of borage oil on atopic dermatitis or eczema with reduction in itching, dryness and skin inflammation...Enjoy... For more information go to HighAltitudeOrganics dot net. 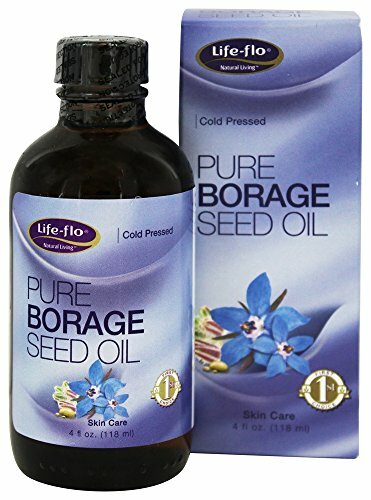 Pure Borage Seed Oil by Life Flo Health Products 4 oz Liquid Pure Borage Seed Oil 4 oz Liquid Borage Seed Oil comes from the seed of the wildflower commonly called the starflower and is a little known secret for keeping your skin smooth and glowing. It's a penetrating oil that helps restore moisture and softness to dry skin. It is high in the essential fatty acid gamma-linolenic acid (GLA). It is light non-greasy and easily absorbable. Directions For personal care apply to skin on face and body. Repeat as desired to soften and moisturize skin. Can also be used to hydrate the scalp and hair. 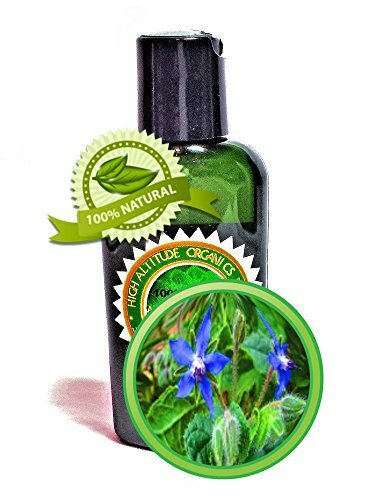 Other Ingredients Borago Officinalis (Borage) Seed Oil (99.5 ) Tocopherol (Vitamin E) (0.5 ) (Antioxidant to preserve the freshness of the oil). Warnings Keep out of reach of children. As with all dietary supplements consult your healthcare professional before use. See product label for more information. Borage Oil helps to reduce symptoms of PMS such as cramping, breast tenderness and mood swings. It has a higher concentration of gamma-linolenic acid (GLA) than black currant or evening primrose oils. It is also a natural anti-inflammatory and is commonly used to ease stiffness and pain for arthritis sufferers. Borage oil is the preferred source of GLA among many nutritionists and natural health practitioners. The Borage plant (also known as starflower) has been consumed for generations in Europe, but only recently was its seed identified as a potent natural source of the omega-6 essential fatty acid (EFA) derivative, gamma-linolenic acid (GLA).